Walter Braunfels came late to the string quartet medium, and his Quartets Nos. 1 and 2 (of three) date from 1944, when he was in his early 60s. At the time, he was based in Überlingen on Lake Constance, an internal exile in Nazi Germany, having been forcibly removed from his position as director of the Cologne Academy of Music on account of his part-Jewish ancestry. Immediately after the war he was reinstated, and the two quartets were premiered in Cologne in 1946. The light and gracefully melodic nature of this music gives little impression of the traumatic times in which it was written. Braunfels devoted much of his time in southern Germany to chamber music, and was clearly engaging with Classical-era models. 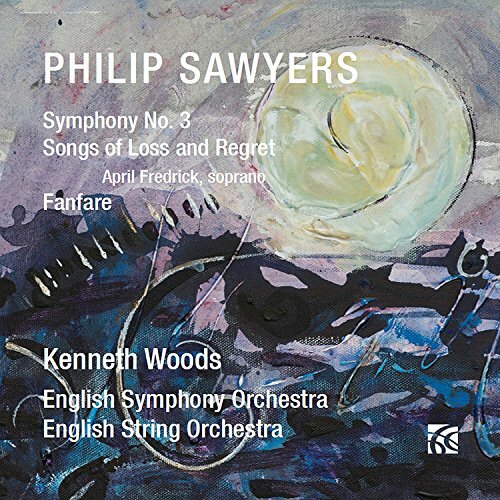 The structure and scale of the two works harks back to middle-period Beethoven, as do many of the expressive features, the rigorous thematic development and the modest but proficiently voiced counterpoint. Some of the textures are more radical, especially the regular division of the quartet into two pairs of instruments in the First Quartet, and the harmony is a little more advanced as well, but, from a technical perspective, everything here speaks of a composer who came of age at the turn of the century. The First Quartet is the more adventurous of the two in terms of mood and texture. Its subtitle, “Verkündigung” (Annunciation), refers to the opera Braunfels composed in 1933–5, from which the quartet derives most of its themes. A sense of operatic mood setting is apparent in the sprightly opening phrases, and in the third movement scherzo, where flageolet harmonics give a spectral quality to some of the later variants. The Langsam second movement is conceived on a grand, operatic scale, yet retains a sense of intimacy for the refinement of the textures and melodic language. The Second Quartet is more Classical in conception, more upbeat for its major key and for its light bouncy textures, often with delicate melodies in the violins supported and propelled by repeated-noted figures in the cello. The middle movements of the First Quartet have German performance directions, whereas in the Second all are Italian, an indication, perhaps that Braunfels was focusing more on Classical models in the latter work. The Auryn Quartett gives energetic and elegant readings of these two works. The unity of ensemble is impressive, especially in the passages of rhythmic unison, such as the opening of the Second Quartet. The tonal control is impressive too, although the sound sometimes takes on an abrasive edge in very loud passages, of which there are many in the First Quartet—but better that than hold back for the big climaxes. 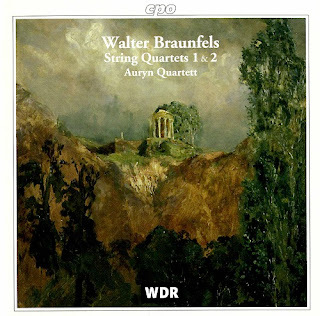 While sound is mostly rich and warm, the Adagio of the Second Quartet sounds a little thin, a consequence perhaps of Braunfels’s Classical inclinations here. This release is not described as a first recording, but it is the only version of these quartets currently available. It is a reissue of a release from 1998: The reissue is simply a renewed distribution of the original disc in its original packaging, no doubt designed to cash in on the Braunfels revival that has recently been taking place in Germany, a canny move on the part of CPO, and fully justified, given the label’s central role in bringing it about in the first place. This review appears in Fanfare magazine, issue 41:3. The new music world waits patiently for Kurtág’s long-delayed and much anticipated first opera, Endgame, initially commissioned by the Salzburg Festival, but now tentatively penciled in for La Scala in 2018. 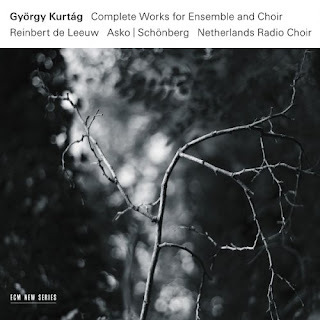 Meanwhile, conductor Reinbert de Leeuw has been documenting, with equal patience, Kurtág’s existing large-scale vocal and instrumental works, with these recordings made in Amsterdam and Haarlem between 2013 and 2016. The composer himself was not directly involved, but the project is only one step removed from his influence: Leeuw and his ensemble have previously recorded all these works under the composer’s supervision, and these new recordings also carry his blessing, albeit after the fact. The set is entitled Complete Works for Ensemble and Choir, but that doesn’t give much of an idea of what is included. Song cycles predominate, with a single voice and ensemble featured in Four Capriccios, the Pilinszky songs, Messages of the Late Miss R.V. Troussova, and the Akhmatova settings. Vocal soloist, choir, and ensemble are heard in the Beckett setting and Colindă-Baladă. The Songs of Despair and Sorrow are for choir and instruments, and the remaining works, Grabstein für Stephan, …quasi una fantasia…, the Double Concerto, and Brief Messages, are all for instrumental ensemble. Kurtág’s style is aphoristic, and even in these large-scale works, ideas are brief and pithy, and phrases are short. That makes extended listening a challenge. But it is a worthwhile one, not least for the invention and variety, even within individual movements. Although his voice is distinctive, Kurtág has a tendency to go back to basics with every new work, to forget everything he has done and to start from scratch with the basic building blocks of sound. That often means using very unusual instruments as if they were completely mainstream. So, for example, a choral movement might be accompanied throughout by just a cimbalom or accordion, playing delicate but inscrutably complex harmonies. Performances and recordings here are excellent throughout. Kurtág’s personality shines through in the atmosphere of every work, that unnerving dichotomy of surface stillness and underlying Angst. In the songs, the solo singers are balanced equitably with the ensemble, but retain their clarity of diction and tone. Both the soloists and the choir tackle the extended vocal techniques with apparent ease, giving the impression—vital for Kurtág—that these are standard expressive devices rather than exotic additions. The audio is studio quality, and, thankfully, ECM has not applied its usual dreamy resonance, allowing the music a more precise and clear sound profile. Many of the works, notably Grabstein für Stephan, are written for groups of ensembles in specific spatial arrays, something that surround-sound could have better conveyed, reason enough, perhaps, for another traversal of these works in the future. The most valuable aspect of this release is the access it offers to Kurtág’s larger-scale works. He is well-represented in the catalog: ArkivMusic currently lists 87 discs devoted to his music, but most of these focus on a small number of chamber works, the music for string quartet; Signs, Games, and Messages, Játékok, and the Kafka Fragments. Nothing on this set is a first recording, but most of the music is difficult to obtain elsewhere. A Hänssler disc from Marcus Creed and the SWR Vokalensemble is entitled György Kurtág: Complete Vocal Works (93174), but, bizarrely given the “complete” claim of both releases, shares only a single work, Songs of Despair and Sorrow—also on the SWR release are Omaggio a Luigi Nono, op. 16, and Eight Choruses, op. 23. Songs of Sorrow and Despair sound good in both versions, but Reinbert de Leeuw has the edge in terms of clarity and focus of tone. Grabstein für Stephan is also available on an excellent DG recording from Abbado and the Berlin Philharmonic, with Jürgen Ruck the guitar soloist (0289 479 0341 3), but that recording is of the full-orchestra version, whereas this is for a smaller ensemble. Messages of the Late Miss R. V. Troussova is available in several versions, including recordings conducted by Boulez and Eötvös. It is a piece that relies above all on the Pierrot-like versatility of the soprano soloist, and Natalia Zagorinskaya here more than holds her own against the competition. The packaging is in the usual arty, high-concept ECM format, the discs in separate envelopes within a card slipcase. The booklet includes some of Kurtág’s own artwork, which is fascinating, along with essays from Reinbert de Leeuw and Paul Griffiths, as well as an encomium from the composer himself endorsing the project. Texts are included, in the original Romanian, Hungarian, and Russian with parallel English translations (Russian is Cyrillic only). Finding the track listings among all the full-page images can be tricky, and linking performers to works requires tedious cross-referencing, but all the info is there. An important document then, of major works from one of the great Modernist composers of our era. The presentation seems to encourage extended listening, but individual works are better appreciated in isolation. So treat it as a resource, and you’ll find yourself returning time and again.